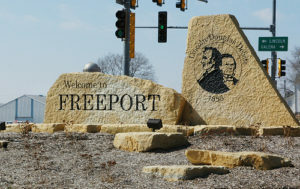 Look no further Freeport, a new small business web development company in your area is now contributing to your economic growth! Since 2009, Severity Design is pleased to service the digital marketing needs of businesses in the Freeport, Rockford Metro area. There is no need to go with a large national company where you are treated like a number. We specialize in excellent service with beautiful designs that work. You really have only 8 seconds to acquire that website visitor and turn them into a customer. If your website is dated or just not working properly, most users will go with your competitors. We don’t want you to lose customers, we want to help you grow your business using the power of the internet. Your website is the race car, and marketing is the fuel. Your website does no good sitting out there on the information highway with no one finding it! You need a proven strategy that will draw new customers and drive traffic to your website. This includes social media marketing, email marketing and Google PPC marketing. With Google PPC, we can get your website ranking on 1st page Google in a matter of 48 hrs. You only pay when they click! So you have a website, but it’s not doing exactly what you want it to do. You’ve spent all this money to get up and running, but does it perform? Download this FREE educational whitepaper that explains 5 of the most important things your website needs in order to be successful.